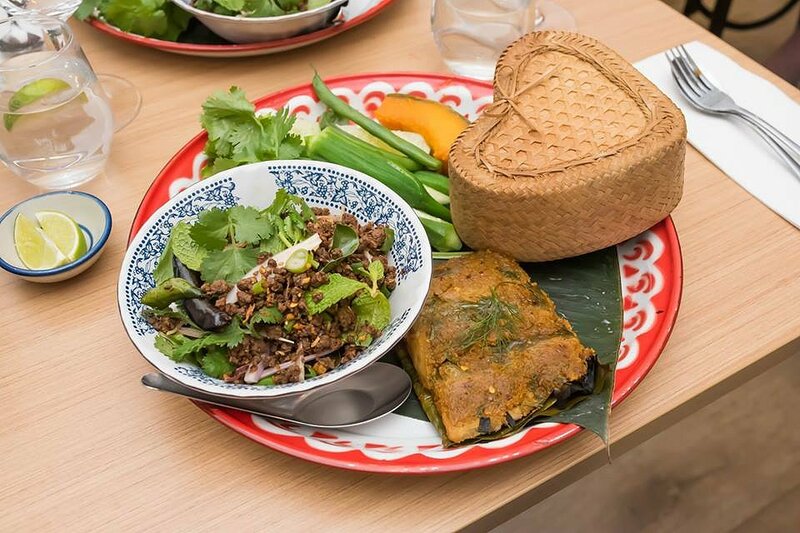 Kin Kin Thai Eatery has been serving authentic Thai and Street Food in their bright and cheery dining room for a little over a year. 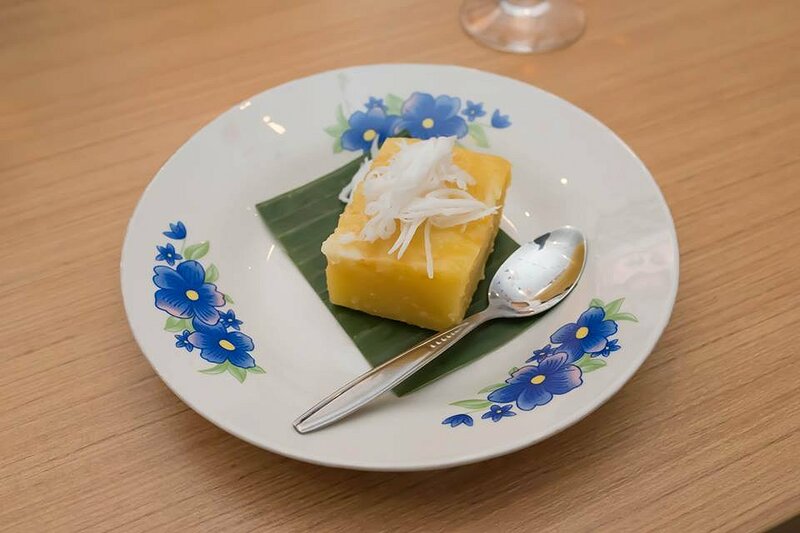 In line with the Thai New Year celebrations Kin Kin have held their first Food and Wine Degustation event – a one night only occasion that took diners on a culinary tour of Thailand from North to South. Adelaide Food Central was delighted to be invited to partake in the delicious four course menu with matched wines. Before the arrival of any food, I was captivated by a welcome drink of Butterfly Pea Flower tea. Renowned for its herbal qualities the tea is an appealing dark blue colour and has a slightly sweet, herbaceous flavour. By adding a squeeze of fresh lime the flavour alters slightly and just like a science experiment the colour excitingly changes. We started our food journey with a Mixed Entrée Plate that centred around a rich and satisfying spicy pork sausage. 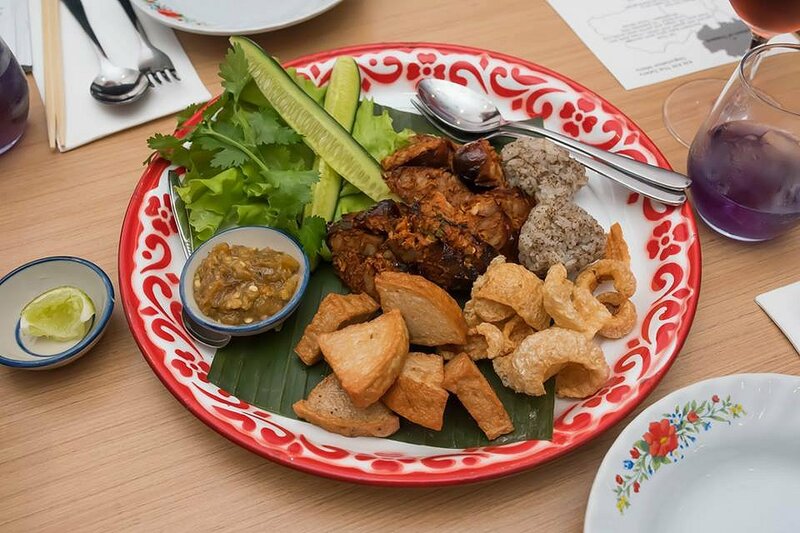 Teamed with sliced fried pork roll, balls of perilla seed sticky rice and curls of crispy pork skin and fresh salad. For me the highlight of the dish was a delicious green chilli relish that released a slow heat filling the entire mouth. I found that wrapping a few items up in a lettuce leaf, with a decent helping of relish was a great way to enjoy all the flavours. 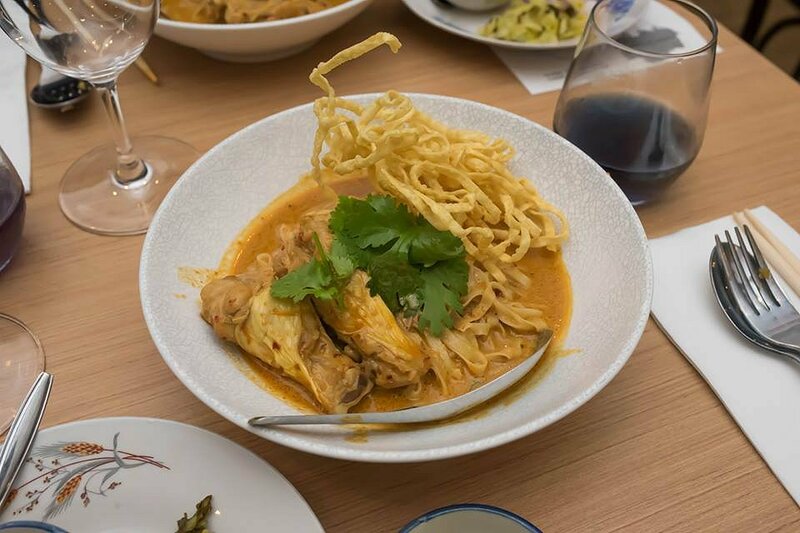 The second course was a Northern Style Rich Chicken Curry served with egg noodles. A generous serve of boiled egg noodles swam in a mild, thick curry sauce, rich in flavours of coconut, curry leaf and turmeric. The use of chicken wings in this dish made it a little difficult to eat, but the meat fell easily away from the bone. The dish was topped with a nest of crispy fried egg noodle. Given the pairing of noodles the dish ended up with a disproportionate ratio of noodle to meat. I did enjoy switching from the curry soaked wet noodles to the light crunchy strands on top and a lack of protein was made up for in the next course. The main course was a duo of fish and beef. I started with the Fillet of Barramundi marinated in a thick paste and steamed inside a banana leaf. The aromatic paste complemented the fish with its mixture of chilli, turmeric, shallot and dill, but it was the pungent lemongrass that dominated the nose and the palate. I then moved my attention to the Marinated Wagyu Beef Mince Salad. The beef was adequately (some may say more than adequately) spiced with fresh green chilli. There was no sauce or liquid as is usually found in a larb, this mince was completely dry – to the point it had a slight crunch. Unusual and challenging to eat at first I got used to the consistency quickly and once I tore up the handful of fresh herbs that topped the dish I found the texture quite pleasant. To finish the meal we were presented with a slice of Melon Cake topped with shredded fresh coconut. The flavour was subtle and with only two elements it was pleasant but felt too simple to finish the meal. What it did do though was make the McLaren Vale Moscato it was paired with absolutely sing. Hutt Street Cellars did a great job of pairing South Australian wines with each of the four courses and wait staff had the tasting notes down pat as they introduced the wine with each course. The staff, all dressed it colourful shirts ran the dining room and kitchen with a military like precision. Water and tea glasses were never empty and food was delivered to tables with ceremony as each element was explained. From my table I could keep a watchful eye on kitchen and bar areas, noting they stayed clean all evening despite a continual turnover of food and drink. On this evening the dining room was at full capacity, yet at no point did I feel that it was too loud to enjoy the company of fellow diners. It is no wonder that the dining area radiated a positive vibe, content and satisfied diners, eating and drinking underneath the canopy of bright coloured flags. Indeed we joined them, a wonderful meal, great wine and outstanding service. To attend Kin Kin’s next degustation event keep an eye on their Facebook page for notice of future dinners. In the meantime you can enjoy Kin Kin’s tasty menu Tuesday to Sunday for dinner or Tuesday to Sunday (excluding Saturday) for lunch.